Here is the list of the hotels near La Villette. Book your hotel near La Villette today, Friday 10 May for the best price, reservation and cancellation free of charge thanks to our partner Booking.com, leader in on-line hotels reservation. Below here is the list the 50 closest hotels of La Villette, sortable according your criteria. You will find the position of these accommodations on the La Villette hotels map. Located in Saint-Pierre-la-Vieille in the Lower Normandy region, Orbigny Vakantiewoningen has a terrace and garden views. This property offers access to free WiFi. The holiday home is located on the ground floor and features 2 bedrooms, a flat-screen TV with satellite channels and a fully equipped kitchen that provides guests with a dishwasher, an oven, a washing machine, a microwave and a toaster. The accommodation also includes 1 bathroom with a bath. The holiday home offers a barbecue. Guests at Orbigny Vakantiewoningen can enjoy hiking nearby, or make the most of the garden. Caen is 49 km from the accommodation, while Bayeux is 49 km away. Deauville – Normandie Airport is 86 km from the property. Surrounded by green fields in the Swiss Normandy region, Hotel du Golf de Clécy offers en suite rooms with free Wi-Fi access and facilities for making hot drinks. A continental breakfast is available every morning. The restaurant serves snacks as well as traditional dishes from the region using fresh, seasonal produce. You can play golf at the hotel or relax in the spa. Other outdoor activities in the area include horse riding, cycling and fishing. Falaise, the birth place of William the Conqueror, is 32 km from Hotel du Golf de Clécy. Free private parking is provided. Lemoine is situated in Clécy and offers barbecue facilities and a garden. Guests staying at this apartment have access to a terrace. The apartment features 1 bedroom, a TV and a fully equipped kitchen that provides guests with a microwave. Caen is 39 km from the apartment, while Vire is 39 km from the property. Deauville – Normandie Airport is 77 km away. This Logis is located in Clécy near the banks of the River Orne. The hotel offers a buffet breakfast and all guestrooms have a private bathroom, TV and free Wi-Fi. 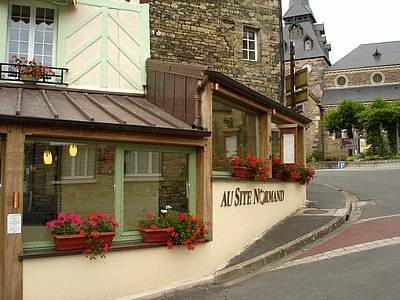 The Logis Hotel Au Site Normand has a restaurant serving a variety of regional specialties and seafood. Guests can eat and enjoy a drink on the hotel’s patio. Guests of the Site Normand can relax in the hotel garden, enjoy hiking and cycling in the surrounding Normandy countryside and visit the nearby Château de La Landelle. Le Jardin is situated in Clécy. The property features garden views. With free WiFi, this apartment offers a satellite flat-screen TV and a kitchen with dishwasher. Caen is 38 km from the apartment. The nearest airport is Deauville – Normandie Airport, 76 km from Le Jardin. Providing garden views, Chateau La Cour in Culey-le-Patry features accommodation, a garden and a terrace. Free WiFi is featured. There is a private bathroom with bath and free toiletries in each unit, along with a hair dryer. A continental breakfast is available every morning at the bed and breakfast. There is an in-house restaurant, which serves European and International cuisine and also offers dairy-free, gluten-free and vegetarian options. Guests can also relax in the shared lounge area. Caen is 38 km from Chateau La Cour, while Bayeux is 47 km away. The nearest airport is Deauville – Normandie Airport, 76 km from the accommodation. Guest accommodation Clécy Preferred hotel ! Set 200 meters from the banks of the Orne River, gîtes de la petite suisse is a holiday home located 200 meters from Clécy village centre. Free private parking is available. Free WiFi and free private parking are provided at the property. gîtes de la petite suisse is set in a traditional Norman farmhouse. Guests may relax in the property's 3000 m2 fenced garden; Shops such as a bakery, a butcher's, a grocery store can be found in Clécy. Bayeux is 43 km from gîtes de la petite suisse, while Bagnoles de l'Orne is 41 km away. Guests can enjoy various activities in the surroundings, including canoeing and hiking. Deauville – Normandie Airport is 54 km from the property. Set in Clécy, 40 km from Caen, Le Manoir de Placy features free WiFi access and free private parking. You will find a kettle in the room. The rooms feature a private bathroom with a walk-in shower, bathrobes and free toiletries, as well as a hairdryer. Breakfast is served daily and includes regional produce, homemade cakes and juices. The property also offers packed lunch at an extra fee and upon request. A range of activities are offered in the area, such as hiking. Cabourg is 49 km from Le Manoir de Placy, while Bayeux is 43 km from the property. The nearest airport is Deauville – Normandie Airport, 54 km from the property. Set 1 km from the centre of Clécy, Gîte du Moulin du Vey sits in a 1.6-hectare park and it offers self-catering accommodation with private, furnished terraces. Wi-Fi is free of charge in the entire property. The cottages at Gîte du Moulin du Vey feature a seating area, a flat-screen TV with a DVD player, and the private bathrooms are complete with a bath tub or a shower and toilet. The fully-equipped kitchenettes include a microwave, refrigerator, stove and dishwasher. An electric kettle is also provided. A washing machine and clothes dryer are at guests’ disposal upon prior request. Local products can be bought on site. Free private parking is provided on site making Gîte du Moulin du Vey an ideal base from which to explore Normandy by car. Set on a 2-hectare park, Chambres d’Hôtes du Moulin du Vey is 1 km from the centre of Clécy. It offers free Wi-Fi, a terrace and a dining room where guests are invited to enjoy a continental breakfast every morning. All the soundproofed rooms feature a flat-screen TV with satellite channels and a private bathroom with a bath and free toiletries. During the winter, evening meals can be enjoyed at Chambres d’Hôtes du Moulin du Vey if you reserve in advance. Packed lunches can also be requested at an extra cost. Activities in the area include paragliding, climbing and kayaking. Free private parking is available on site and Caen is 45 km away. Chambre d'hotes de la Mousse in Saint Remy sur Orne features 3-star accommodation with a garden and a terrace. This 3-star guest house offers free WiFi. Guests can enjoy garden views. At the guest house, every room comes with a wardrobe, a TV and a private bathroom. All rooms will provide guests with a fridge. A continental breakfast can be enjoyed at the property. Guests can grab a bite to eat in the in-house restaurant, which specialises in French cuisine. You can play table tennis and darts at the 3-star guest house. Caen is 38 km from Chambre d'hotes de la Mousse. The nearest airport is Deauville – Normandie Airport, 76 km from the property. La Chauminette is set in Clécy. This holiday home provides accommodation with a terrace. The 3-bedroom holiday home is equipped with a kitchen with a dishwasher and 1 bathroom with a bath. Hiking can be enjoyed nearby. Caen is 43 km from the holiday home, while Vire is 34 km away. The nearest airport is Deauville – Normandie Airport, 82 km from the property. Located in Condé-sur-Noireau, La Plaisance features accommodation with free WiFi and access to a garden with a terrace. A continental breakfast can be enjoyed at the property. Caen is 47 km from the bed and breakfast. Deauville – Normandie Airport is 86 km from the property. Set in Saint-Germain-du-Crioult in the Lower Normandy region, Holiday home Château de Bremesnil P-836 is a 4-star property featuring free WiFi. Guests staying at this holiday home have access to a fully equipped kitchen. The holiday home includes 4 bedrooms and a living room with a TV. Bagnoles de l'Orne is 50 km from the holiday home. Deauville – Normandie Airport is 94 km from the property. Offering a garden, La Ferme Studio Apartments are situated in Condé-sur-Noireau 56km from the D-Day landing beaches. Free private parking is available on site. Both studios include a seating area and a fully-equipped kitchen with an oven, microwave and stovetop. The private bathrooms come with free toiletries. Towels and bed linen are available. La Ferme Studio Apartments also includes a barbecue and a covered heated outdoor dining area with. Free bicycle hire is available at the property and the area is popular for cycling. Bayeux is 48 km from La Ferme Studio Apartments, while Bagnoles de l'Orne is 36 km away. Caen is 40 km from the property. Guest accommodation Saint-Omer Preferred hotel ! Situated in Saint-Omer in the Lower Normandy region, Le Pti' chez vous has a terrace and garden views. Guests staying at this holiday home have access to a fully equipped kitchen. The holiday home features a flat-screen TV, 1 bedroom and a living room. The holiday home offers a barbecue. Guests at Le Pti' chez vous can enjoy canoeing nearby, or make the most of the garden. Caen is 38 km from the accommodation, while Vire is 41 km away. The nearest airport is Deauville – Normandie Airport, 74 km from Le Pti' chez vous. Set in Combray in the Suisse Normande area, 27 km from Caen, Ma Cabane du Canada boasts a sun terrace and views of the garden. Every room includes a shared bathroom. There is a shared lounge with a TV at this property. Free use of bicycles is available at this guest house and the area is popular for cycling, hiking, kayaking and paragliding. Cabourg is 46 km from Ma Cabane du Canada, while Bayeux is 41 km from the property. Located 3 km from the centre of Condé-sur-Noireau, L'Aumondière features a 4-hectare park with a an outdoor, covered swimming pool with a counter current swim system. BBQ facilities and a terrace with a outdoor furniture are available. Offering free Wi-Fi internet access, the spacious apartments provide a fully equipped kitchen with an oven, a dining area and a living room with an LCD TV. A grocery shop can be found 1.5 km away and bars and restaurants are located in the centre of Condé-sur-Noireau. L'Aumondière is 12 km from Clécy, 13 km from Flers’ Train Station and 25 km from Vire. It is situated 30 km from the town of Falaise, where you can visit the château of William the Conqueror. The Pontécoulant Castle is 2 km away. Guest accommodation Hamars Preferred hotel ! La grange is set in Hamars and offers barbecue facilities, a garden and a terrace. Guests staying at this holiday home have access to free WiFi. The holiday home includes 1 bedroom, 1 bathroom with a hair dryer, a living room, and a kitchen. A TV is featured. A continental breakfast is available each morning at the property. Guests at the property can enjoy table tennis on site, or go cycling or hiking in the surroundings. Caen is 39 km from La grange. The nearest airport is Deauville – Normandie Airport, 75 km from the accommodation. Featuring garden views, L'ECURIE GITE is a holiday home set in the heart of La Pommeraye, in Norman Switzerland, 52 km from Ouistreham Beach. Guests staying at this holiday home have access to a fully equipped kitchen. The holiday home comes with a TV and 2 bedrooms. Meals can be prepared on site. Free WiFi is provided throughout. A spa and wellness centre can be found 900 metres from the property. Bagnoles is 41 km far from L'Ecurie Gite while Bayeux is 43 km away. Various activities can be enjoyed nearby such as kayak, hiking, biking. Caen is 31 km from the holiday home and the nearest aiport is Deauville-Normandie, 54 km away. Offering a sun terrace and views of the garden, L'Ecurie is a Guest House in a former Norman farmhouse. The property is set in La Pommeraye in the Lower Normandy Region, 31 km from Caen. L'Ecurie features free WiFi throughout the property. Guests can enjoy a daily breakfast with homemade jams at an extra charge. The onsite restaurant La Route des Crèpes serves crepes and galettes as well as local products. The restaurant provides a terrace with views of the garden. The area is popular for horse riding and cycling. A spa is located at 900 meters from the property. Ouistreham is 48 km from L'Ecurie, while Bayeux is 46 km from the property. A free private parking is available on site. Set in a renovated 17th-century farmhouse, Gîte de la Cour is an 8-minute drive from the centre of Campandré-Valcongrain. It offers free Wi-Fi access, a children’s playground and a garden with outdoor furniture. All the soundproofed rooms feature wooden floors, a seating area and a flat-screen TV with satellite channels. The private bathroom is complete with a shower. Some rooms are set over 2 levels. Breakfast can be enjoyed every morning at Gîte de la Cour. Guests can go for a walk in the woods that surround the property. Caen is 31 km away and free private parking is available on site. This château is surrounded 24-hectares of dales and offers elegant guest rooms in the village of La Pommeraye. It offers free Wi-Fi and is a 47-minute drive from Caen. All guest rooms at the château feature parquet flooring, a view of the surrounding area and a private bathroom. Bathrobes and slippers are provided and some rooms have a fireplace. Breakfast is served every morning daily at Château de la Pommeraye and there is a 19th-century lounge with antique furniture, a fireplace and a library area. A restaurant is available on site, guests need to book a table upon prior request. Free private parking is available on site and the D-Day landing beach, Gold Beach, is 74 km from the château. Cabourg is reached by car in 1 hour and the Clécy Cantelou golf course is 11 km away. Bed and Breakfast Cahan Preferred hotel ! Located in Cahan, 47 km from Caen, Le Manoir de Bénédicte features a seasonal, heated outdoor pool set in a vegetable patch. Free private parking is available on site. For your comfort, you will find free toiletries and a hairdryer. Le Manoir de Bénédicte features free WiFi throughout the property. You will find babysitting service at the property and you will be able to enjoy a hot drink by the fireplace in the shared living area. Guests can enjoy various activities in the surroundings, including horse riding and canoeing. Falaise is 20 km from Le Manoir de Bénédicte, while Bagnoles de l'Orne is 33 km from the property. Hotel La Pommeraye Preferred hotel ! Offering personalised and privatised spa and massage programmes, this spa resort is set in a renovated farmhouse in the Normandy countryside and features a heated indoor pool. Overlooking the courtyard and garden, each guest room features original stone walls and exposed beams. Free Wi-Fi is provided and some of the en suite rooms have a four-poster bed. A French breakfast is prepared every morning at Domaine de la Pommeraye & Spa. After breakfast, you can relax in the garden or request beauty treatments in the spa. An evening meal can be prepared by the hosts upon request before 16:00. Guests can swim in the pool for free every evening from 18:30 to 22:00 and on Sunday morning from 09:00 to 11:00. Private sessions can be organised at the spa, upon reservation and for a surcharge. With free private parking on site and a free electric vehicle charging station, this property is 35 km from Andanes Forest. The centre of Caen with its train station is 40 km away. This hotel is located in the heart of Swiss Normandy, in Thury-Harcourt. It is set in a large garden and offers free internet access and free private parking. Each guest room at the Logis Hotel Le Relais De La Poste is individually decorated and has a private bathroom. Guests can enjoy regional cuisine in the elegant dining room and a buffet breakfast is served every morning. The Hotel Le Relais De La Poste is just a 20-minute drive from Caen. Falaise is approximately 26 km away. Set in the countryside in the heart of La Suisse Normande, La Vieille Ferme is located 25 km from Caen and offers accommodation in Donnay. Guests may be accommodated either in a self-catering cottage or in a double room at this property. The large double room has an en-suite bathroom and private entrance. Each cottage has 1, 2 or 3 bedrooms, a living room, bathroom and fully equipped kitchen. The area is very popular for cycling and walking. You can engage in various activities, such as fishing, canoeing and kayaking. Bike hire can be arranged at the property. Thury-Harcourt is 5 km from La Vieille Ferme. Gîte du Fourneaux is a detached holiday home with a barbecue, located 2 km from Pont-d'Ouilly in the Norman Switzerland. The property is 38.9 km from Caen, boasts views of the garden and offers a terrace. Free WiFi and free private parking are available on site. The kitchen is equipped with a dishwasher and an oven, as well as a coffee machine. A flat-screen TV is available. Other facilities at Gîte du Fourneaux include a sun terrace. The area is popular for horse riding, cycling and hiking. The city of Pont-d'Ouilly, a 5-minute drive from the property, offers multiple activities such as canoeing or fishing in the Orne River. Other activities that guests can do in the surrounding areas include: climbing, hang gliding and zip lining. D-Day landing beaches and the Côte Fleurie can be reached within 70 km. Falaise is 19 km away, Bagnoles de l'Orne is 35 km from the property and Bayeux is 50 km from Gîte du Fourneaux. Ouistreham beach is 55 km away. Holiday Home Rue Du Grand Clos is located in Pont-d'Ouilly. The accommodation is 45 km from Caen. The holiday home comes with a TV and a living room. The kitchen features a dishwasher and a microwave. Bagnoles de l'Orne is 50 km from the holiday home, while Vire is 39 km away. The nearest airport is Deauville – Normandie Airport, 66 km from Holiday Home Rue Du Grand Clos. Boasting barbecue facilities, a garden, and a terrace, Gite du Tilleul provides accommodation in Pierrefitte-en-Cinglais with free WiFi and garden views. Guests staying at this holiday home have access to a fully equipped kitchen and a balcony. Hiking can be enjoyed nearby. Caen is 35 km from the holiday home. The nearest airport is Deauville – Normandie Airport, 71 km from Gite du Tilleul. Hôtel de la Place "Chez Fanny"
Located in Pont-d’Ouilly in the Basse-Normandie region, Hôtel de la Place "Chez Fanny" is a 32-minute drive from Flers Train Station. Providing free Wi-Fi access throughout the property, it features a bar, restaurant and terrace. The heated guest rooms at Hôtel de la Place "Chez Fanny" are equipped with a desk. Each room also includes a shower and free toiletries. A continental breakfast is available in the morning with an extra cost. The on-site restaurant serves traditional, French cuisine and is open everyday in July and August. With free public parking on site, the hotel is a 26-minute drive from the multi-activity sport and leisure centre in Cerisy-Belle-Etoile, where guests can play tennis or golf and go picnicking. Tree climbing activities are a 10-minute drive away. This Logis hotel is located in the centre of Pont d’Ouilly, in the heart of Normandy. It offers free Wi-Fi internet access and free private parking. The comfortable rooms are all equipped with TVs and private bathrooms. At the Hotel Du Commerce’s restaurant, guests can enjoy traditional regional cuisine with seafood specialties. The Commerce has several outdoor terraces and a flower-filled garden. The hotel is 20 km from Falaise, 45 km from Caen and 18 km from Flers. Ferienhaus Curcy-sur-Orne 400S is situated in Curcy-sur-Orne. Guests staying at this holiday home have access to free WiFi and a fully equipped kitchen. Caen is 28 km from the holiday home, while Bayeux is 42 km from the property. The nearest airport is Deauville – Normandie Airport, 72 km from the property. 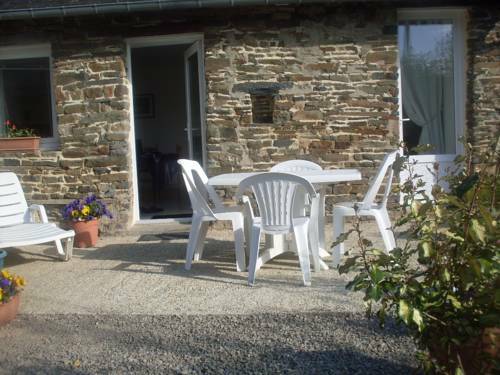 L'Ancien Pressoir is situated in Pierrefitte-en-Cinglais and offers barbecue facilities and a garden. Guests may enjoy the free WiFi. This holiday home has a flat-screen TV, a seating area, a kitchen with a dishwasher and an oven, and 1 bathroom. The holiday home offers a terrace. If you would like to discover the area, fishing is possible in the surroundings. Caen is 40 km from L'Ancien Pressoir, while Vire is 45 km from the property. Deauville – Normandie Airport is 63 km away. Featuring free WiFi, Les Hirondelles is set in Moncy. At the guest house, every room includes a wardrobe. Every room is equipped with a private bathroom. Guests at Les Hirondelles can enjoy a continental breakfast. Bagnoles de l'Orne is 44 km from the accommodation. The nearest airport is Deauville – Normandie Airport, 104 km from the property. Located in Aunay-sur-Odon, Hotel de la Place is situated only a 30-minute drive from Caen and its ferry port. Saint-Lô is only a 35-minute drive away. Choose among elegant single and double rooms in which you will find all the amenities you need. Half-board and full-board options are available so that you can make the most of your stay. Hotel de la Place has also built its reputation on the quality of the food served in its welcoming restaurant. After a delightful lunch, embark on a walk in the famous Suisse Normande and enjoy its preserved landscapes. The Caen memorial and the D-day beaches are also located close by, making the hotel a perfect place for those wishing to explore the region's rich heritage. Bed and Breakfast Saint-Pierre-dʼEntremont Preferred hotel ! Situated in Saint-Pierre-dʼEntremont, Secret Valley Les Vaux provides free WiFi, and guests can enjoy free bikes, a seasonal outdoor swimming pool and barbecue facilities. A terrace with mountain views is offered in every unit. A continental breakfast is served daily at the property. The bed and breakfast offers a children's playground. Cycling can be enjoyed nearby. Bagnoles de l'Orne is 39 km from Secret Valley Les Vaux. The nearest airport is Deauville – Normandie Airport, 98 km from the property. Ferienhaus Les Moutiers-en-Cinglais 400S is located in Les Moutiers-en-Cinglais. Free WiFi is offered. The holiday home is equipped with 3 bedrooms and a fully fitted kitchen with a dishwasher. Caen is 26 km from the holiday home, while Ouistreham is 43 km from the property. Deauville – Normandie Airport is 64 km away. Located in Estry in the Lower Normandy region, Le Grand Pont provides accommodation with free WiFi. Guests at the bed and breakfast can enjoy a continental breakfast. A bicycle rental service is available at this property. Saint Lo is 47 km from Le Grand Pont. The nearest airport is Deauville – Normandie Airport, 97 km from the property. Set in Taillebois, this detached holiday home features a garden with a barbecue. The unit is 43 km from Caen. Free WiFi is available. The kitchen has an oven and a microwave, as well as a kettle. Free private parking is available at the holiday home. A bike storage is available at the property and the area is popular for horse riding and fishing. Bagnoles de l'Orne is 27 km from Honey suckle cottage, while Vire is 34 km away. The area is popular for canoeing and hiking. The nearest airport is Deauville – Normandie Airport, 61 km from the property. Situated in the village of Fresney-le-Vieux in the heart of Lower Normandy, this guesthouse is located in a 17th century building and surrounded by 1.5 hectares of parkland. Guestrooms at La Mare aux 3 Diables offer views of the surrounding gardens and have a modern marble bathroom with a walk-in shower. A self-catering cottage with a private entrance is also available. The cottage features an equipped kitchen with a dishwasher and a living room with a TV and DVD player. For guests staying at the guesthouse, breakfast is served daily. In the evening, guests can also enjoy a set meal shared with their hosts featuring regional and local produce. Picnic tables are available in the gardens. La Mare aux 3 Diables is 17 km from Caen and 37 km from Cabourg. Featuring accommodation with a private pool, Les Champs du Douits is located in Aunay-sur-Odon. The property features pool views. The holiday home is located on the ground floor and is equipped with 6 bedrooms, a flat-screen TV and a fully equipped kitchen that provides guests with a dishwasher. The holiday home also offers 3 bathrooms with a hot tub and a shower. A continental breakfast can be enjoyed at the property. Speaking English and Spanish, staff are always on hand to help at the 24-hour front desk. The holiday home offers 3-star accommodation with a hot tub and barbecue. If you would like to discover the area, hiking is possible in the surroundings. Caen is 23 km from Les Champs du Douits, while Bayeux is 32 km away. The nearest airport is Deauville – Normandie Airport, 66 km from the accommodation. Offering free WiFi and garden views, Normandy Nature Paradise is an accommodation located in Vire. Guests have a private terrace. The holiday home has a TV, a well-equipped kitchen with a dishwasher and an oven, and 2 bathrooms with a shower. A continental breakfast is served every morning at the property. Normandy Nature Paradise offers a barbecue. There is a garden at this property and guests can go fishing and hiking nearby. Bagnoles de l'Orne is 47 km from the accommodation. Deauville – Normandie Airport is 103 km away. Hameau is located in Bernières-le-Patry and offers free bikes, barbecue facilities and a garden. Guests staying at this holiday home have access to a fully equipped kitchen and a terrace. The holiday home has 1 bedroom and 1 bathroom with free toiletries. Cycling and fishing can be enjoyed nearby. Bagnoles de l'Orne is 48 km from the holiday home, while Saint Lo is 50 km away. The nearest airport is Deauville – Normandie Airport, 106 km from hameau. Boasting a hot tub, La Gnossienne is set in Rapilly. The accommodation has free WiFi. The holiday home is equipped with 3 bedrooms and a fully fitted kitchen with a dishwasher and an oven. A TV and a DVD player are offered. The holiday home offers a barbecue. Guests can also relax in the garden. Caen is 47 km from La Gnossienne Menilvin, while Bagnoles de l'Orne is 45 km from the property. Deauville – Normandie Airport is 60 km away. Featuring accommodation with a terrace, La Gymnopédie is located in Rapilly. This property offers access to free WiFi. This holiday home has 3 bedrooms, a TV, and a kitchen. The holiday home offers a barbecue. Guests can also relax in the garden. Caen is 47 km from La Gymnopedie Menilvin. The nearest airport is Deauville – Normandie Airport, 60 km from the accommodation. Located at the centre of Flers, this 2-star hotel is just 850 metres from the 17th-century castle. It features a terrace and free Wi-Fi is provided in the soundproofed guest rooms. Cable TV and views of the town centre feature in each room. All of the rooms have a simple décor with wooden furnishing, and a hairdryer is provided in the private bathrooms. Traditional French cuisine is served in the restaurant at Hotel le Saint Germain. Enjoy a continental breakfast while reading the newspapers provided. Flers Train Station is 700 metres from the hotel and private parking is free on site. Houlme Golf Club is a 10-minute drive away. Situated in Flers, APPART'HOTEL61 offers accommodation with free WiFi, a seating area, a flat-screen TV and a kitchen. A dishwasher and coffee machine are also featured. The aparthotel offers a terrace. Bagnoles de l'Orne is 30 km from APPART'HOTEL61, while Vire is 29 km away. The nearest airport is Deauville – Normandie Airport, 100 km from the accommodation. Hotel Flers Preferred hotel ! Located in the town centre of Flers, 300 metres from Saint-Germain Church, this hotel offers a garden and rooms with a satellite, flat-screen TV and free Wi-Fi access. The rooms at Le Galion have a seating area and a private bathroom with free toiletries and hairdryer. A buffet breakfast is served daily and can be brought to the comfort of your room. A selection of gourmand pastries are delivered daily by a traditional pastry baker. Restaurants and bars can be found within a walking distance. The hotel is located 350 metres from the train station and 26 km from Bagnoles-de-l’Orme and its casino. There is a free, private car park on site and a bicycle and motorbike closed storage. Below here is the hotels map of La Villette. Names and details of La Villette hotels can be shown on the map clicking on the prices icons.